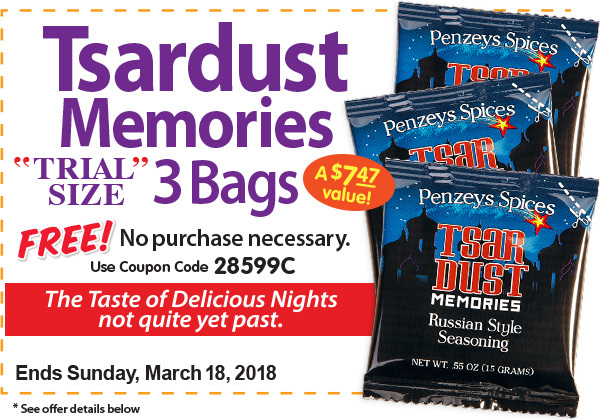 Limit three free Penzeys Tsardust Memories Trial Size Bags per household during run of promotion. Not applicable to prior sales. While supplies last. Coupon must be presented at time of purchase. Call 800-741-7787 to redeem by phone. Online, visit www.penzeys.com, and select the coupon item you'd like to receive by entering "28599C" into the “apply code” field at checkout. Standard shipping rates apply. Offer ends midnight Sunday, March 18, 2018.